The Tomorrow Center joined efforts with Lindsey Grimm from the Morrow County Office of Recycling and Litter Prevention to participate in cleaning debris from the Whetstone River at Heimlich Park in Cardington on Sept. 18. 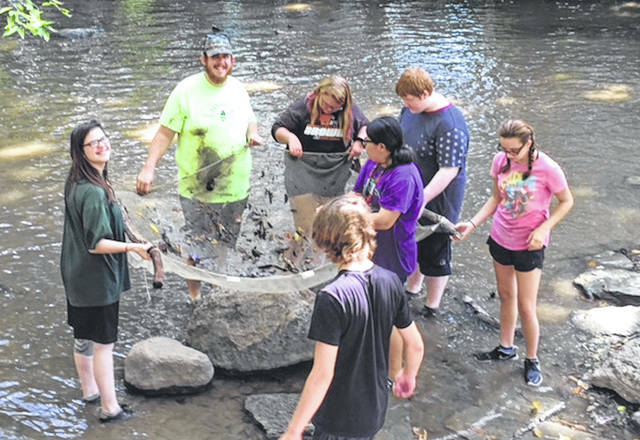 CARDINGTON — The Tomorrow Center joined efforts with Lindsey Grimm from the Morrow County Office of Recycling and Litter Prevention to participate in cleaning debris from the Whetstone River at Heimlich Park Sept. 18. Twenty-two Tomorrow Center students and three staff along with Lindsey Grimm, James Anderson from Marion Parks Department and ODNR officer Tyler Eldred waded the river in both directions collecting a variety of debris. Tomorrow Center Science teacher Jessica Anderson was instrumental in planning this event. This has become an annual event that teaches the students the importance of recycling and litter prevention. In the afternoon education stations were presented by Marilyn Weiler from Headwaters Outdoor Education Center, volunteer Kim Good, Matt Stooksbury with the Morrow County Soil and Water District and James Anderson (Marion Parks Department). The Tomorrow Center is a community school located in Cardington that serves students grades 7 through 12.